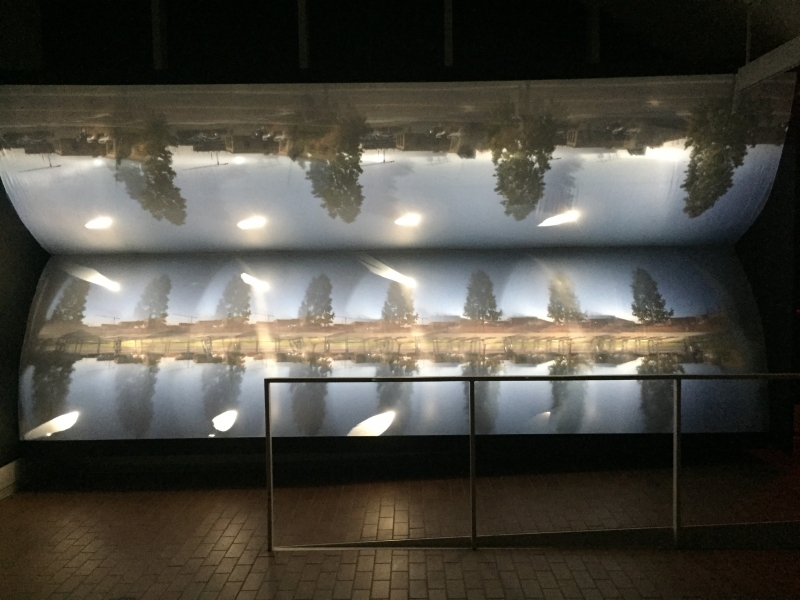 Five against Eight is an architecturally integrated optical project that is part of the Heightened Perspectives show at UNC Charlotte’s Projective Eye Gallery, September 16 – November 30. 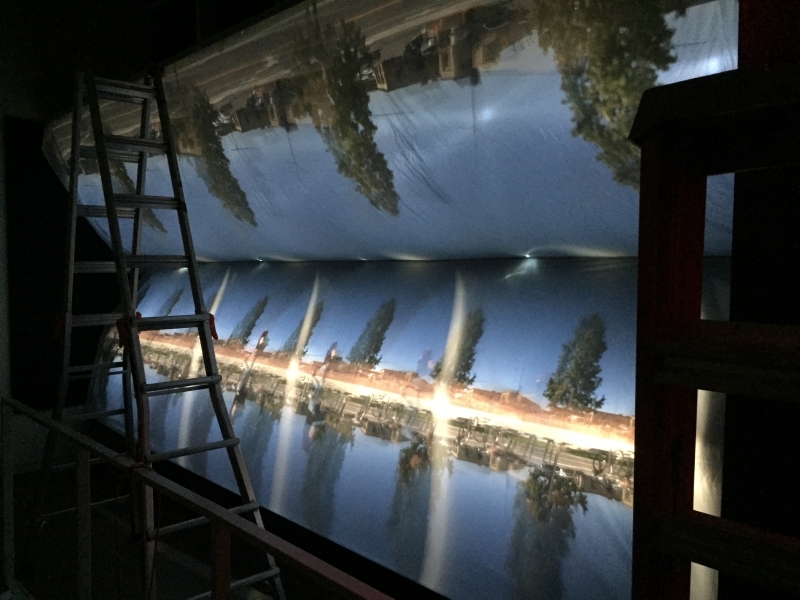 It is an architecturally integrated optical work that uses views of the neighborhood, street life, and the skyscape to build a luminous collage on curved fabric wall-elements. 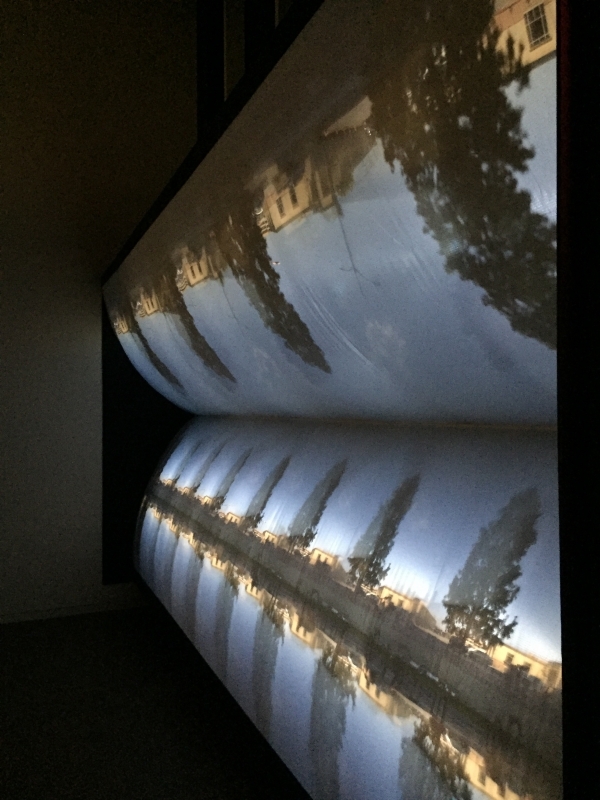 The 13 camera obscura apertures are arranged in a visual polyrhythm (5 against 8) that fills the matched curves of soft nylon rear-projection cloth. 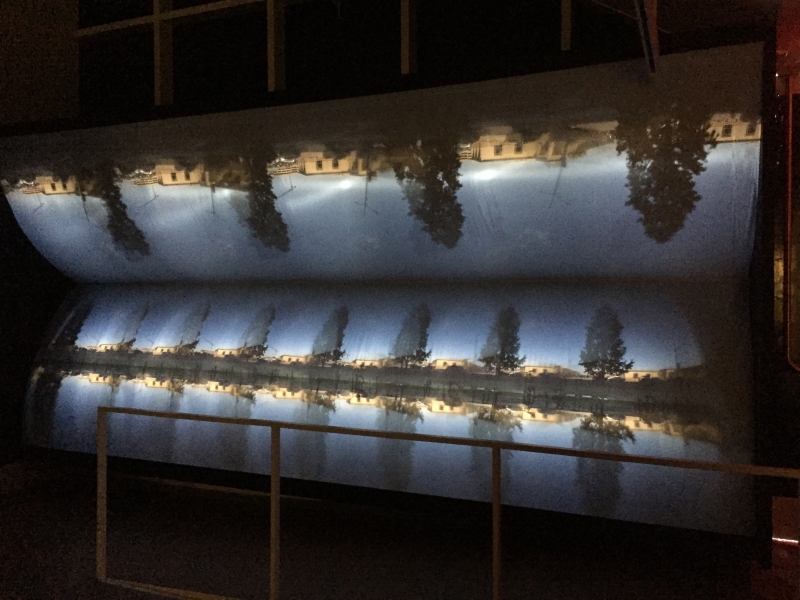 The unusual panoramic projection is soft to the touch, allowing viewers to absorb the rhythm of the composition from afar and to examinie it closely for subtle, live details, using touch as well as sight to explore and alter the image. The outdoor view is repeated at two scales, large above and small below , as well as in an upright and upside-down reflection. The sky’s light and clouds drift and change slowly, while the burst of colorful activity dominate the scene when traffic and pedestrians sweep by near the gallery. 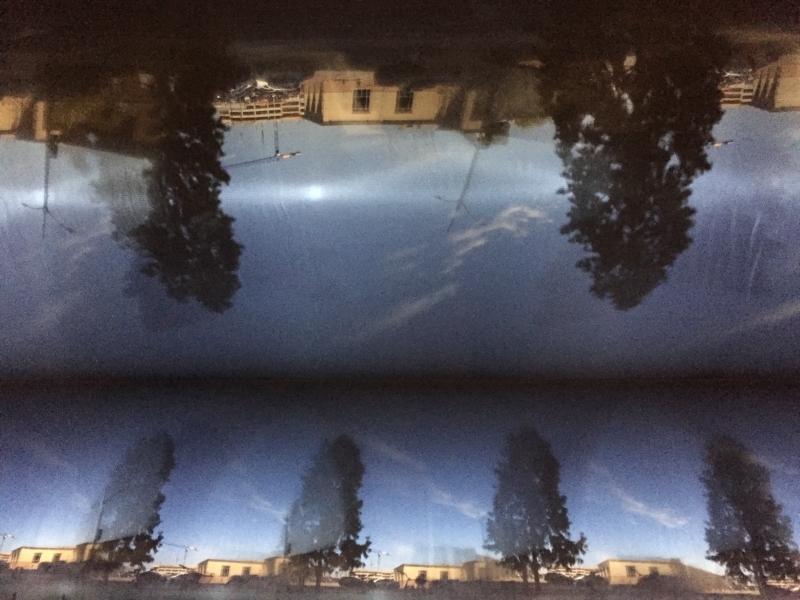 The work is based on the camera obscura, a Latin term for ‘darkened chamber’ in which a small opening admits light from the bright outdoors into an interior space. 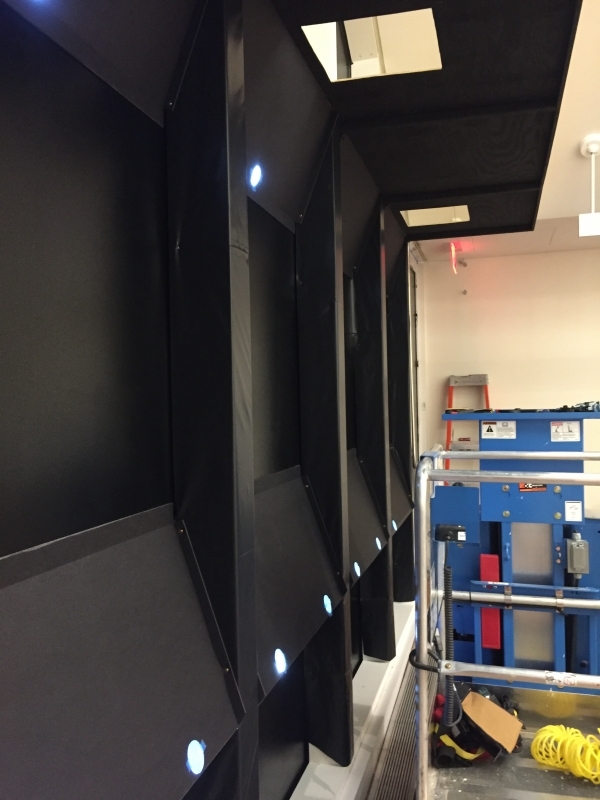 This installation is an architectural integration engineered for bright imagery, visible in conjunction with other projected works. It covers an entire wall of the gallery, offering opportunities for exploration and contemplation. Filmmaker Phil Solomon’s American Falls complements Jackson’s live optics for a combined experience of two very different modes of visual meditation and finding meaning.